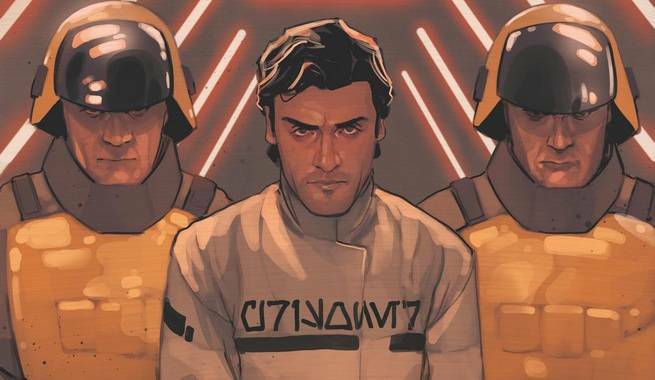 Marvel Comics has provided ComicBook.com with an exclusive preview of Star Wars: Poe Dameron #5, from writer Charles Soule and artist Phil Noto. Set prior to the events of Star Wars: The Force Awakens, General Leia Organa has sent Poe Dameron and Black Squadron on a mission vital to the survival of the Resistance. That mission led to an encounter with Agent Terex of the First Order Security Bureau. While Black Squadron survived the encounter, they now find themselves trapped in a Republic prison with Terex! That prison is Megalox Beta, a prison planet that uses an artificial high gravity field to keep the prisoners secured. The prisoners run the show there, and at the top of that food chain is Grakkus the Hutt, the same Hutt who once captured Luke Skywalker in order to add him to his collection of Jedi artifacts during the Galactic Civil War! Star Wars: Poe Dameron #5 goes on sale in comic book stores and in digital comic book apps on Aug 17, 2016. Check out the preview pages in the gallery below.